Will Someone Please Tell Kathy Griffin That We've All Moved On? Last summer, Kathy Griffin made headline after headline after headline after headline for posing with a fake decapitated head of President Donald Trump. She thought it was funny, but a lot of other people didn’t. She was threatened, she lost her New Year’s Eve gig, and she may or may not have lost her friend Anderson Cooper. But, because this is Trump’s America, the country quickly found something new to be outraged by, and Griffin’s career survived. 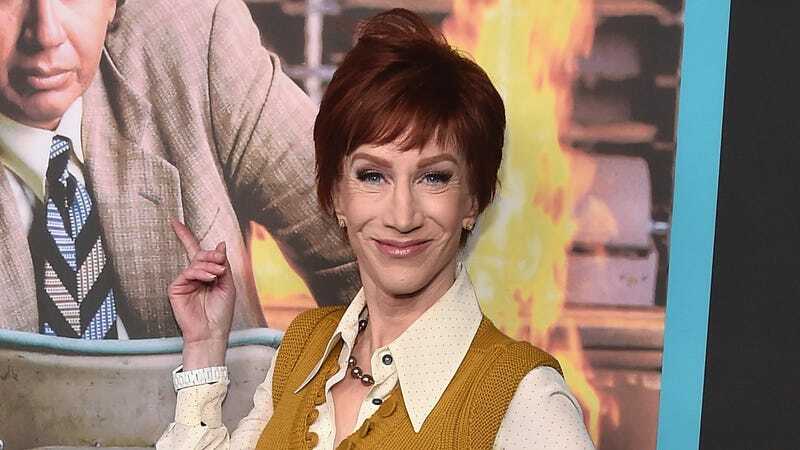 People quickly forgot about the faux beheading and moved on to other things, like the #MeToo movement, gun violence, the Mueller investigation, Trump’s alleged corruption scandal, Black Panther, the new Kacey Musgraves album—honestly, you name it, and we prioritized it over Kathy Griffin. Why? Because she’s fine! She’s on a world tour! She sold out Carnegie Hall in one day! This rebound was always going to happen to Kathy Griffin because this is what Kathy Griffin has been doing for decades. By not shutting up about the whole thing, she Streisand Effect-ed her way into something resembling professional ruin, thereby creating a perfect narrative for a “comeback” tour, so to speak. Forgive the cynicism—it’s easy now that we’re a year beyond the initial outrage—but this was always going to happen. The “Suddenly Susan” and “Kathy Griffin: My Life on the D-List” star lost income, received death threats, was denounced by Trump, landed on an Interpol criminal list and was afraid to leave her home. She said she was under investigation by the Department of Justice for two months. Remember when she called a press conference and said, “This is America, you shouldn’t have to die for it”? (I still can’t believe she said that.) Yeah, well, she didn’t die for it. She’s fine. Everything went according to plan. Forgive me while I enable caps lock: MEGHAN MARKLE [ALLEGEDLY] DUMPED HER FIRST HUSBAND BY TAKING THEIR VITAMIX OUT OF THE APARTMENT AND SENDING HIM HER RINGS IN THE FREAKING MAIL. The Royal bride-to-be dumped first husband Trevor Engleson by post, according to Andrew Morton’s biography - Meghan: A Hollywood Princess. The couple had married only 18 months earlier in an exuberant ceremony at the Jamaican beach hotel once favoured by Marilyn Monroe and Errol Flynn. She ended their marriage ‘totally out of the blue’, sending their rings in the mail after walking out with a £360 blender from their West Hollywood home and moving to Toronto. Smells like someone cheated, but who’s to know!